Il Corso, is known by those in the know for its simple and delicious cuisine, which spans the various regions of Italy. Chef Andrea Giacomoni does not disappoint and adds special touches to make each dish unique. For example, his buffalo mozzarella is not simply tomato and cheese on a plate; he boils and peels the tomatoes before plating the dish and then includes imported prosciutto so that there’s no skin to distract from the meal. His tuna carpaccio is unique in that he adds celery root and summer black truffles. 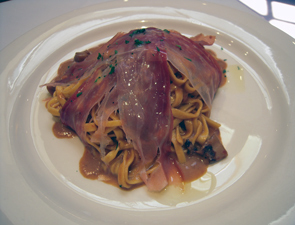 His tagliolini is wrapped in an imported prosciutto. Each of these touches is indicative of the extra care Chef Giacomoni gives to each dish before it makes its way to your table. An additional unique aspect is that at Il Corso's new location, across the street from its previous location, the kitchen is large enough so that everything -- bread, focaccia, pasta, ice cream, sorbet -- can be created in house. Because Emilio prepares the desserts daily, including the fabulous ice creams and sorbets, no printed dessert menu exists. That said, half the fun is in perusing the tray of sweet creations that arrives at your table after your entree so you can choose which delectable one (or two) you want to try. Additionally, with so many pasta creations, you might choose to have a half order of two instead of simply trying one! The artwork at Il Corso is vibrant and stunning, as it was painted by Gaetano Franzese and made exclusively for the restaurant. The first thing you’ll notice about it is its vibrant use of color, including bright yellows, blues and reds that punctuate the cream-colored walls. The pictures are mostly abstract in nature, although some -- such as those of the sky and sea -- are easy to decipher. All paintings are encased in gold frames so as not to detract from their immediacy. And Franzese doesn’t just paint on canvas, either; two of the paintings -- the ones that frame the hallway from the first dining room toward the back dining room -- are painted on wood! Franzese was born in Naples and was not always a painter. He trained with the ballet at Lyceum Academy in Naples from 1980 until 1986, after which time he made multiple appearances as a dancer and actor in Italy, Israel, Germany and Austria. By 2001 – 2002 he'd decided to fulfill his passion as a painter and studied painting in Germany. Since then he’s had multiple exhibitions in Germany, Austria, Spain, Italy, the United States and Slovenia. 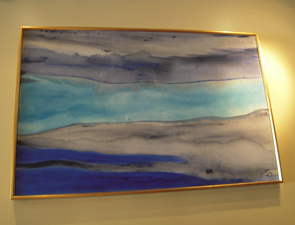 He currently resides in Germany, but his paintings have a permanent residence in Il Corso!